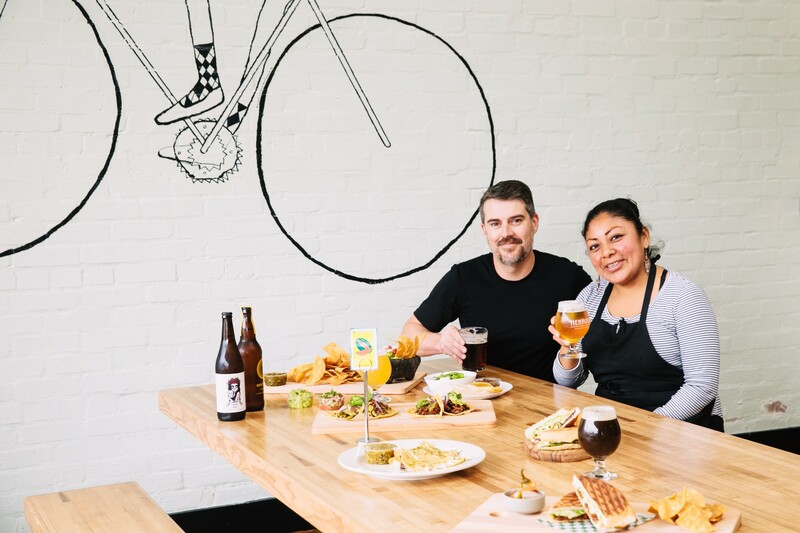 Husband-wife duo serve up craft brew and Oaxacan-inspired fare at a kid-friendly spot in the Laurel. 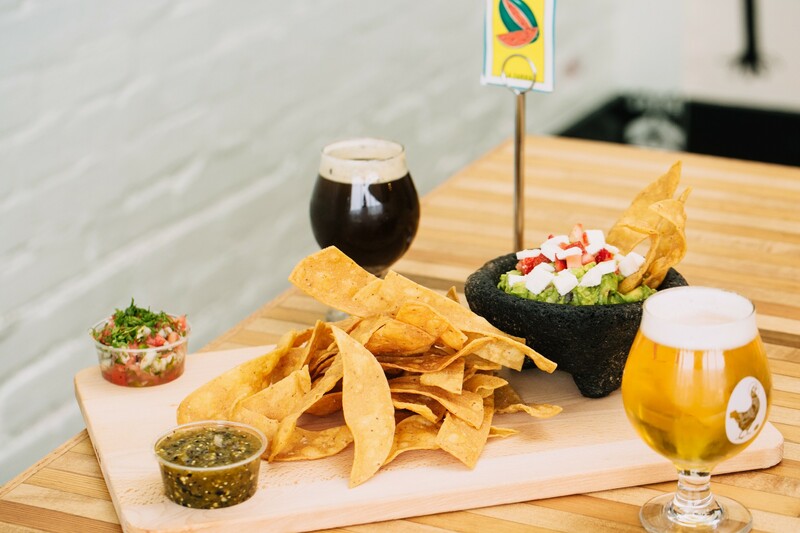 Chips and guac, and brew, arrive in the Laurel. Rich Allen spent a decade working in craft brewing and restaurants, but he wanted to bring a family-friendly pub to the Laurel neighborhood where he and his co-founder and wife, Mercedes Sperling, now live. The couple has a six-year-old son and hoped for a place that people of all ages would enjoy. Degrees Plato, which opened in May and is in its soft-opening phase, has a large, well-curated selection of beers on tap and in bottles. They also serve Oaxacan-inspired fare, adapted for the pub scene. The restaurant doesn’t take reservations. Inside, you order and pay at the counter. (Note: they add an automatic 15 percent “fair wage” tax for the wait staff in lieu of tips.) There are two large communal tables and smaller ones. The servers are friendly. On the left near the front window is a kids’ area, with kid-sized shelves of books and toys. Down the hallway, there is a wall o’ beer: a huge selection of bottles that fill up a glass-covered refrigerator, available to consume on site or to-go. The décor is warm and inviting, with whimsical paintings by Denmark-born artist Anne Bundgaard, including a woman on a bicycle, a man balancing beer on his arm, and people and animals doing handstands. I visited twice and, each time, there were young ones playing in the kids’ area. Allen and Sperling both previously taught English in Japan, and noticed that in other parts of the world that “kids are part of the fabric of life,” he explained. In the past, Allen says he’s worked in some restaurants that were not so kid-friendly, so one of his goals was to integrate everyone in Degrees Plato. When they dreamed up the food menu, they wanted something beyond burgers or sausages. As an homage to Allen’s mother, who is from Mexico, they hired Flor Crisotomo, a Oaxacan cook who spent time in the kitchens of Nido, Calavera, and Communite Table. Most of the menu consists of small plates for sharing, in addition to a selection of tortas that come with freshly fried tortilla chips, which make for a heartier meal. They’re still testing out items during the soft opening, which means some of the menu will change on different visits. The best dishes I tried were vegetarian. The calabacitas torta — filled with grilled zucchini, refried black beans, Oaxacan cheese, and guacamole plancha-pressed between bread from Peña’s Bakery in the Fruitvale — was tasty and filling. I’m always pleasantly surprised when restaurants can get the vegetarian options right. Degrees Plato co-owner Rich Allen and cook manager Flor Crisotomo. The epazote quesadillas, which come with three half-moon-shaped tortillas filled with cheese, black beans, and tomatillo salsa and spicy guac on the side, were nicely presented. The thick, house-made corn tortilla means the quesadillas are on the crunchier side, not like a typical quesadilla made with a flour tortilla. Some of the dishes could use some tweaking. The jicama and cabbage slaw, while refreshing, needed a brighter note with more acid and sweetness, and to be sliced into smaller pieces to make it easier to eat. The tacos, which are offered as a three-way for $9 — pork shoulder, chorizo, or squash—became soggy after sitting a while at the table. While the restaurant is very kid-friendly, the menu items are not specifically tailored for kids. On one visit, I came with three children under age seven, and they could not stop eating the tortilla chips, still glistening after coming out of the fryer, made from Oakland-based La Finca Tortilleria. But some of the dishes we ordered were too spicy; Allen says this is something they’ll likely adjust, and not just for kids’ palates, but adults, too. Allen balks at the idea of “dumbing down” a menu for children, however. In many parts of the world, kids just eat what parents eat, and there is not a segregated children’s menu. He says that the Americanization of food culture can create picky or unadventurous eaters. I wholeheartedly agree with these sentiments, though a more detailed menu, stating what dishes are spicy, would be helpful when considering how to order. For those bringing children, the side of black beans and tortillas (for $5) is a good option, as it’s not as spicy. Ditto the epazote quesadillas, which are filled with beans and cheese ($7), though the side of guac and tomatillo salsa are spicy. They eventually may add a protein for kids, but in the meantime the pork adobo sandwich can work. Adding a side dish of grilled zucchini and squash that’s already a part of some of the kitchen’s repertoire could be a good vegetable option for kids, too. Allen is clear that they’re still ironing out the menu. “We’re really just trying to execute at a higher level every day. We’re refining and growing.” They may add a chicken dish down the line, for example.